Both states lead in atrocities against Dalits and Adivasis, and the situation has worsened over the years. Consider this stunning statistic: Madhya Pradesh and Rajasthan together have about 12 per cent of India’s Dalit population, but account for 25 per cent of all the atrocities committed against them in the country, according to National Crime Records Bureau (NCRB) data for 2016. The same is true for Adivasis – these two states have about 24 per cent of the country’s tribal population, but witness 46 per cent of all atrocities against them. It can’t be a coincidence that these rates of crime against both Dalits and Adivasis are so high in these two states, and that both have seen vociferous – often violent – protests by upper castes against the SC/ST Atrocities Act, and even against reservation for these sections. Nor can it be a coincidence that both are currently ruled by the Bharatiya Janata Party (BJP). 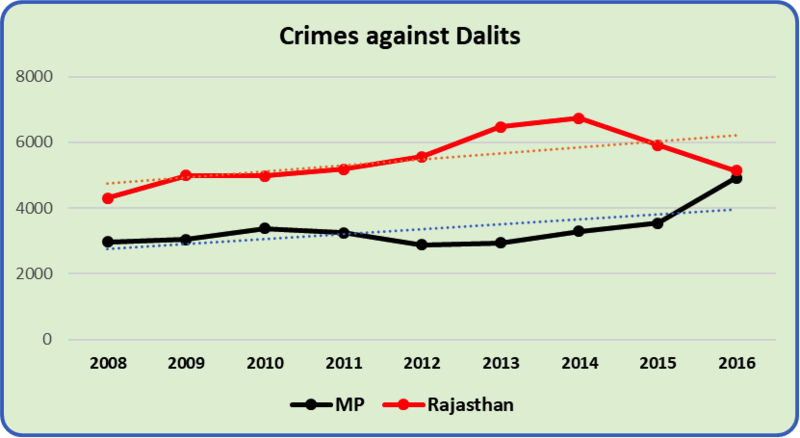 In the last decade, crimes against Dalits, as recorded by police, have steadily increased in both states although Rajasthan shows a dip in recent years (more about that later). 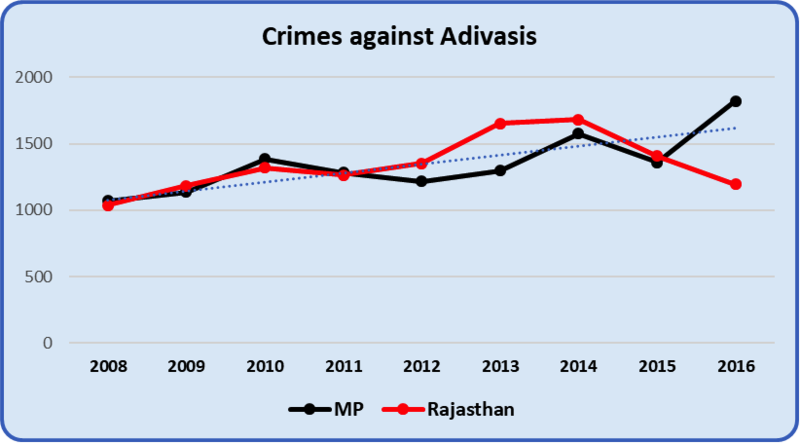 Similarly, atrocities against Adivasis too have risen in both states with a similar dip in Rajasthan in recent years. The dip in 2016 is a devious sleight of hand. Till 2015, crimes against SC and ST communities included both IPC crimes read with the Prevention of Atrocities Act (POA) as well as straightforward IPC crimes without invocation of POA. Since 2016, which is the last year for which data is available, crimes under IPC without POA are no longer included. A footnote at the bottom of the relevant table (7A.1) explains this in the following way for Dalits: Atrocities refers to Crimes committed against SCs by Non-SCs/STs. Cases under only IPC (without SC/ST Act) have been excluded as those cases refers to Crime against SCs by SCs/STs. A similar footnote in Table 7C.1 does the same for Adivasis. This a not just statistical jugglery. 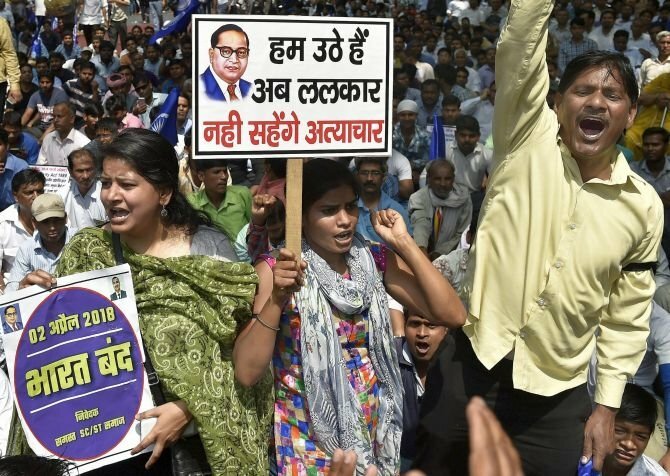 In the case of, say, murder of a Dalit person, the police may just not invoke the POA in the chargesheet, and that will take it out of the data for atrocities against Dalits. Of course, there may be instances of Dalits murdering another Dalit. But, this device usually offers an easy way of reducing the crime records under POA. Similarly, for Adivasis. Earlier this year, when the Supreme Court diluted the POA provisions by putting stiff pre-conditions for arrest and charging of people accused of committing atrocities against Dalits and Adivasis, there was an explosion of anger across the country. During a protest bandh called by Dalit and Adivasi organisations, and supported by the Left, upper caste groups attacked Dalit and Adivasi activists causing several deaths in MP and Rajasthan. There was justifiable anger among Dalits and Adivasis that the Modi government had not seriously objected to the dilution by the Supreme Court. Neither did it move quickly to rectify the situation by bringing in a corrective ordinance. This was finally done in August when another country-wide protest had been declared. Anti-reservation movements too have been a recurrent occurrence in both the states. In Rajasthan, Jats and Gujjars have been demanding separate reservation for their respective communities with a barely concealed animosity towards the existing SC/ST reservations. In MP, after the POA dilution and subsequent rectification, an organisation of non-SC/ST communities called SAPAKS (Samanya Picchdaa Evam Alpsankhyak Samaj) became super active holding rallies and protests and even heckling candidates from the BJP and the Congress. Both parties – fearing an upper caste backlash against them – have been pandering to such outfits. All this has led to a further alienation of the Dalits and Adivasis. The cost of this will be paid mainly by the ruling BJP in both states because of additionally being blamed for betraying farmers and failing to provide jobs.